Parts of Delhi turned red on Wednesday as thousands of farmers, demanding loan waivers and increase in minimum wages, hit the streets in the national capital. The massive Mazdoor Kisan Sangharsh Rally, organised by the Centre of Indian Trade Unions (CITU), All India Kisan Sabha (AIKS) and the All India Agricultural Workers’ Union (AIAWU), began from Ramlila Maidan and culminated at Parliament Street. The protests by farmers have increased sharply over the last four years. The most recent one was in Maharashtra where farmers marched to Mumbai from Nasik, covering a distance of 180 km on foot over five days. However, the Central government has been claiming that its policies are pro-farmers. The farmers’ plight in India – how deep is India’s farm crisis? India is an agrarian country. 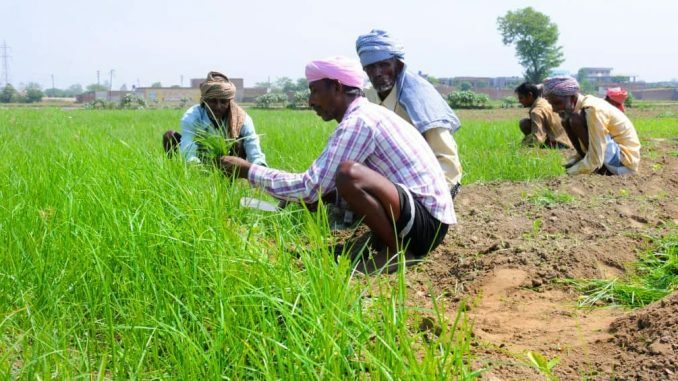 Over 50 per cent of Indians are into farming. According to estimates, the agriculture sector accounts for 18 per cent of India’s total Gross Domestic Product (GDP). However, this trend is declining and if you go and talk to a farmer and ask him about agriculture, he will say it is no more profitable as it used to be. According to a study by the Organisation of Economic Cooperation and Development (OECD), farming in India is not profitable for over two decades. And this is one of the reasons farmers across the country are forced to leave their fields and take to the streets every now and then. The OECD is a grouping of 26 countries and India is the only nation among them where the agriculture sector is not profitable. It’s is not because the country is alien to farming. The history of agriculture in India dates back to as early as the Indus Valley Civilisation. Despite it, the country is still lagging in agriculture growth. In 2012-13, the agriculture growth rate of India was 1.5 per cent and rose to as high as 5.6 per cent during the UPA rule. However, it dropped to 0.2 per cent in 2014-15 after the Narendra Modi government came to power in the Centre in 2014-15. In 2015-16 the agriculture growth rate was at 0.7 per cent, a sharp 4.9 per cent fall from the year 2014-15. One can’t deny the pressure of rapidly rising population as one of the major issues for India’s agrarian crisis. According to government data, India’s average farm size was very small at 1.15 hectare in 1970 and since then the landholding has been declining steadily. Seventy-two per cent farmers in India are small and marginal landholders with less than two hectares of the farm field. Unlike big farmers who own big lands, they have a little bargaining power and almost no say over prices. And if their crop production gets affected due to weather and disaster, pests, diseases or shortage of inputs like seeds and irrigation, they are left with indebtedness that leads to suicides. Another major issue the farmers face is the absence of marketing infrastructure due to which they are forced to approach middlemen which adds salt to injury. Both the BJP and the Congress had governed the country for almost equal period in the last two decades, so none of them can blame the other and the poor state of agriculture is their collective failure. The farming sector is the backbone of the Indian economy but it is vulnerable like any other sector and the government needs to make sure the farmers get sufficient and deserving prices for their produces.